About five years ago Suze found a reference to Elizabeth on Twitter, and followed it up. It turned out that although there was information to be found on Wikipedia and other sources outlining the remarkable life of this lady. Suze, who has been a Manchester resident all her life, could not understand why she had not heard of Elizabeth or of her amazing exploits. 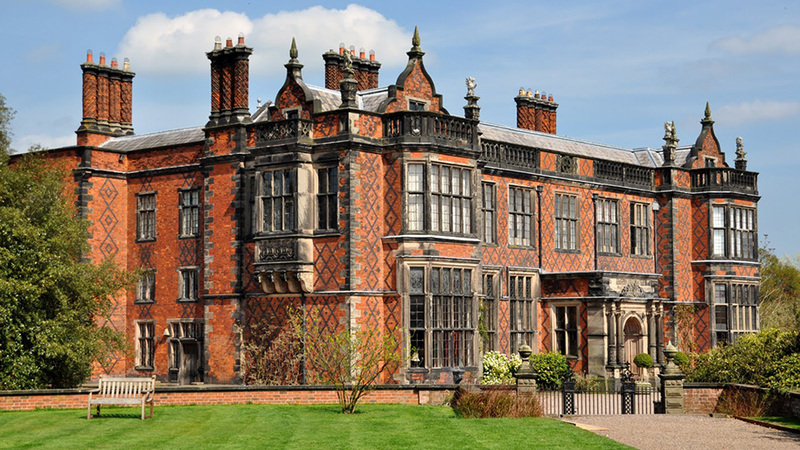 This interest was spurred on when, soon afterwards, Suze went on a visit to Arley Hall (above) with her local W.I. and discovered a poster with even more information. She decided at this point to find out more, spending a great deal of time and energy finding from many original information sources, the life that Elizabeth led. Elizabeth was born in Doncaster in 1733, the daughter of a school teacher. From the age of fifteen she spent time in domestic service, in the great houses of Yorkshire and Lincolnshire. During this time it is thought that she probably met John Raffald who eventually became head gardener at Arley Hall in 1760. Coming over to Arley Hall, Elizabeth worked as a housekeeper. The couple were married in March 1763. When she was thirty Elizabeth and John moved to live near Manchester Cathedral, this is when her work really gathered speed. During the next few years she gave birth to nine childr en although not all of them survived. As well as this she ran a successful confectionary shop, set up a Register Office for employment of servants, opened a cookery school, ran the King’s Head coaching inn in Salford, catered for a pub in the Market place in Manchester, hired out carriages, ran the officer’s mess based in her pub, catered for the races at nearby Kersal Moor and for many public and private dinner parties. Elizabeth was also involved in printing ventures in conjunction with Mr Harrop, who published the Manchester Mercury, at the time the city’s only newspaper. But perhaps the most important aspect of this busy lady’s life was the writing of a cookery book in 1769 containing over 800 original recipes, the first edition selling over 400 copies. She sold the copyright of the book for £1400 (equivalent today to £150,000). It was reprinted 13 times with a further 23 pirate editions appearing. The book contains the first recipe for ‘Bride Cake’, the forerunner of the modern wedding cake and gave instructions on how to ice the cake using almond icing. It was seen as the book every good housewife should have to hand. Sadly the good times did not last and the pub she ran was declared insolvent in 1778, but Elizabeth picked herself up and opened a coffee shop. It seems her husband had a fondness for the drink and he left and went to London leaving Elizabeth to fend for herself. She died of a ‘spasm’ on 23 April 1781 and is buried in the Raffald family plot at St Mary’s Church in Stockport. But, for some unknown reason, her name was not added to the headstone. However other memorials to Elizabeth exist. One may be found as a blue plaque on the wall of Selfridges in Exchange Square, Manchester. This replaced an earlier wall plaque on the M&S store, destroyed by the 1996 IRA bomb. Suze, having found what an amazing woman Elizabeth Raffald was, set about having a further plaque to be placed on the wall of the Arden Arms in Stockport, a pub that was built on Raffald family land. Sufficient money was raised for this plaque, with the descendants of Elizabeth topping up the money to ensure the plaque could be funded. Suze ended her talk by saying that over the last five years she has become so immersed in the life of Elizabeth Raffled that she has written several books on the subject. And will not rest until there is a statue of Elizabeth in Manchester, as she feels that Mrs Raffald should be better known than Mrs Beaton, as she did so more, so much more. L-R in the photo : Dean Fitzpatrick, councillor for education; Anne Kelly, for The Heatons WI, whose members gave generously to the fundraising; David Jackson, 6th generation direct descendant of Elizabeth Raffald whose family donated in memory of their mother, Connie Jackson; Dennis Robinson, Olga Shipperbottom who donated to the fund in memory of her husband Roy, a previous biographer of Elizabeth; Suze Appleton; Sheila Booth for The Heatons WI; Margaret Hope, David’s sister; and her husband, Brian Hope.